Roseville’s popular residential leaf pickup service is underway through January 18, 2019. This convenient program keeps fallen front yard leaves and debris from clogging stormwater drains and washing into our creeks and streams, disturbing the sensitive ecological balance and threatening plants and wildlife. We cannot remove leaves from commercial properties, gated, or private communities. Please keep in mind Public Works crews cannot pick up any bags that contain other green waste, branches, limbs, rocks, animal waste, or metal. If a bag contains any unacceptable materials, crews will place a notice on your door and leave the bag(s) in front of the residence for you to remove. Enter your address into the search box on the map below, and hit "enter," or view a larger map. Click on the colored area of your street. In the new window that opens, click on the image to view instructions on how to participate in the leaf pickup program in your area. Public Works provides free pickup of unbagged front yard leaves in the city’s most densely treed areas, as shown on the map. Rake front yard leaves into piles on the street in front of your home, keeping piles at least three feet from parked cars and away from storm drain inlets. We'll come by with our “Tink” machine and load the piles into a refuse truck for recycling. 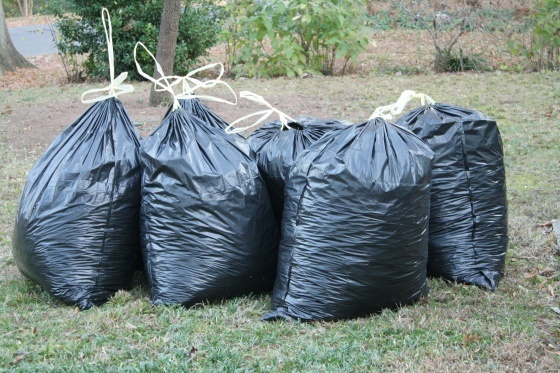 Bagging leaves is permissible in this area (sealed bags should weigh less than 40 pounds). The bags will be picked up during the normal crew rotation; there is no need to call for pickup. Crews remove leaves during a regular rotation that runs from north to south approximately every two weeks. We offer free curbside removal of bagged front yard leaves in most of Roseville, as shown on the map. - Place only front yard leaves in a sealed bag. Each bag must weigh less than 40 pounds. - Place the sealed bags in your driveway near the curb or in the street away from standing water and out of the gutter so you do not impede storm water flow. Pickup days are Tuesdays and Fridays, starting at 6 a.m. Call Public Works - Street Maintenance at (916) 774-5790 for more information.